Like the others have said they make LED lights that screw into a light bulb socket there is another problem hurting them. We all love how LEDs last up to 30,000hrs, but the problem with an LED is that its a diode (the "D" in LED). Because it's a diode, by nature it will only allow current to pass in one direction (unlike an incandescent light) and as a result in order to be run on AC power the energy needs to be rectified to DC. So in converting the AC from the wall to DC the LED can use you lose efficiency to heat loss from the conversion, Then you need to run the rectified voltage through a step down transformer to drop the voltage to keep from frying the LED which means even more loss in efficiency. Ever notice how those cellphone chargers and "wall warts" are warm after they've been plugged in that's lost electrical energy converted to heat mainly by the transformer inside. So in addition to losing a good deal of energy to heat the electronics in the controller board at the base of the LED bulb which do what I just described are not rated for 30,000 hrs and are subject to what they receive from the power company. So the controller board is much more likely to fail before the LED itself. That is why LEDs are so amazing and almost in every flashlight (DC) now, but not in every light socket yet. Ah yes, the good old darksucker theory. I love that one. (You beat me to it, when I started reading this thread I wanted to post that one). The LED bulbs are coming down in price fairly quickly and I was really excited about it but now I'm not so sure. I have yet to see a 75 or 100 watt equivalent at a reasonable price. I almost bought a half dozen of the candelabra base bulbs for the chandelier above our kitchen table a month or two ago but decided to wait a little longer, we have quite a supply of incandescent bulbs for it, there's no sense in junking them for something of unknown quality or reliability when these were so cheap and I know what to expect of them and am completely satisfied with it. (That gives me time to wait on improved quality and lower prices for LED). I get regular emails from newegg.com with their sales. (Some would call it spam but I signed up and have gotten some good deals there). If you get the email there's a promotion code for $7.99 and free shipping, could be significant savings if you're ordering several. I can't vouch for the quality, I've never bought a light bulb from them. That being said, we just bought a new refrigerator and while looking at the various models, I looked at a few with LED bulbs in them. I didn't like the light at all, it had a bluish tint that I found very unattractive. I don't know if that's typical of LED or if it's something particular to refrigerator bulbs but I didn't like it. I'll still reject the CFLs and right now it's not looking real promising for LED either. I just picked up some LED bulbs today to replace some CFL's that I just hate. I found a 3 pack of the decorative globe type that only use 8W each. I have a 3 bulb fixture in the upstairs bathroom that I did have CFL's in. I put these in they're brighter by a lot and turn on instantly. I also picked up a pair of spotlight types to test out in a recessed fixture. They are definitely better than the incandescent bulbs that I did use before, they only use 13W each and provide 750Lumens. I have quite a few recessed fixtures, so I'll eventually be replacing all of those bulbs with the LED's. The only drawback with them is that I could get them to fit in the recessed fixtures I recently installed in the upstairs hallway. The trim ring isn't letting it screw into the socket. Didn't Arctic Splash start a thread on Wmart LEDs? We picked some of those up for around $9/ea and so far, so good. They come on instantly unlike POS CFL bulbs. We only have them in two rooms so far. (4 bulbs in 2 fixtures) Too costly to do all at once. We tried the "candle" type LED bulbs for the wall lamps, but in addition to looking stupid while unlit (white bulb), they looked even worse when lit. That's part of our problem here too, we have several fixtures that take candle type bulbs. That type in CFL were completely useless. Now that LED's are starting to come in a wide variety of formats, I'm going to steadily change over to them. We've all been brought up to buy bulbs based upon the wattage used and not an actual measure of brightness. 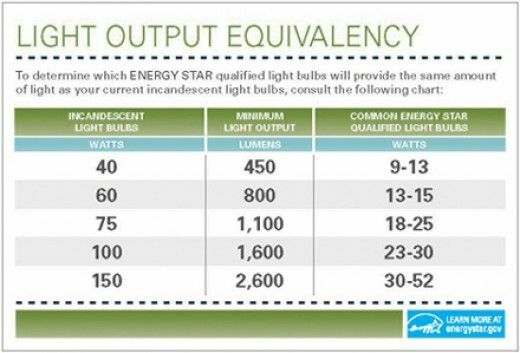 So buying bulbs today it can be difficult to determine what the equivalent brightness is in a CFL or LED bulb. Right now the only issue with LED's is the initial cost of buying them, pricing is coming down, but they're still expensive to get into them. I'll eventually be replacing my outdoor flood lights with LED's as well. streaker69;137136 Wrote: Right now the only issue with LED's is the initial cost of buying them, pricing is coming down, but they're still expensive to get into them. I'll eventually be replacing my outdoor flood lights with LED's as well. 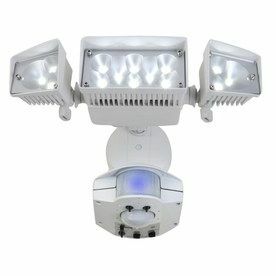 I bought a replacement led flood light combo at lowes. This one.. It's like daylight in my backyard on on the sides. During dusk and dawn it is amazing. Bought it in october I think, works like a champ. Way way way brighter than the $80 (with bulbs) dual motion flood light I replaced with it. The side lights are fantastic gets the vast majority of my back yard. My floods are part of my X10 system, so that really isn't an option for me. But just the LED replacement bulbs would work well. So far, I've been really lucky with the floods that I have out there, I think I've replaced 2 bulbs in 11 years.